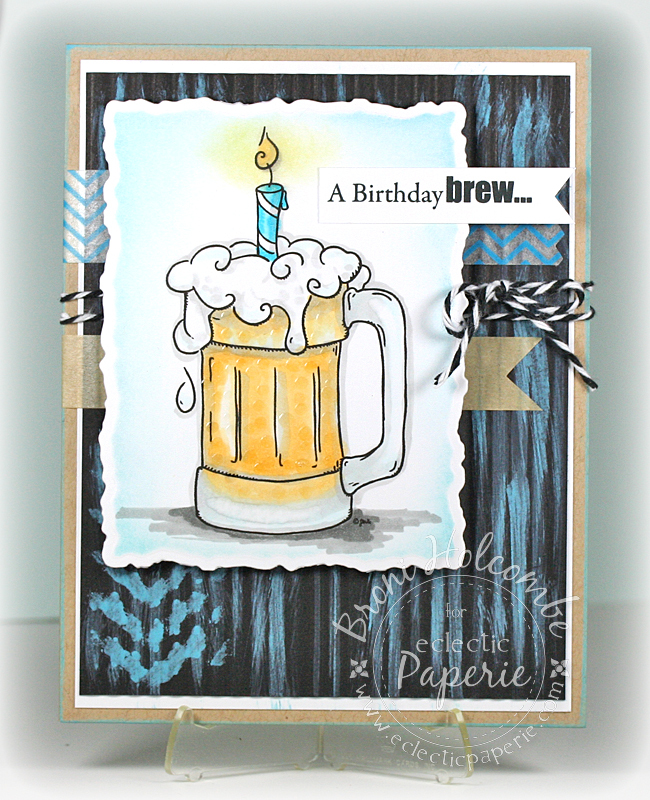 Eclectic Paperie: A Masculine Birthday Brew! Hello, everyone! It's Broni and I'm hosting on the blog today. Do you have a hard time with masculine cards? Well, I do too. Most of my stamps and images are feminine and just plain pretty. So when I saw a digital image of a mug of beer, I just couldn't resist. I actually have another reason that I had to have it…..I work at a beer company! Yes, this will definitely get a lot of use! Not only did I want to use this frosty mug of beer on my card today, but I wanted to add just a little bit of "artsy" too. I started with a kraft layer edged in Broken China Distress paint. That's topped with a black crimped layer. I ran the Broken China Distress paint over it and also painted a small section of the bottom left corner using my TCW Mini Chevron stencil. I added a couple of layers of washi tape and wrapped some Charcoal Twinery twine around the layers. I printed my digital image onto white cardstock and colored it with Copic markers, then I cut it out using a deckled rectangle die. While it was still in the die, I sponged some Tumbled Glass Distress ink around the edges using a large sponge dauber. I also sponged some Squeezed Lemonade Distress ink over the candle flame. If you look closely, you can see some drops of Ranger Glossy Accents that I used to represent the condensation on the mug. So what do you think? Does this work ok for a masculine card? Even if it's a little bit "artsy"? Thanks so much for dropping in to check out my card today! I hope you enjoy your weekend! Darling creation, Broni, and oh so perfect for the men in our lives! Love the effect of the paint on the crimped paper...and then to stencil on it...awesome! The image is wonderful and the condensation is a fun detail It's artsy and masculine. And it made me smile. Well done, Broni! Great card for the men in my family, where in the world did you find that mug? Wonderful - it is always good to start one's day with a big smile. Wonderful masculine card Broni. 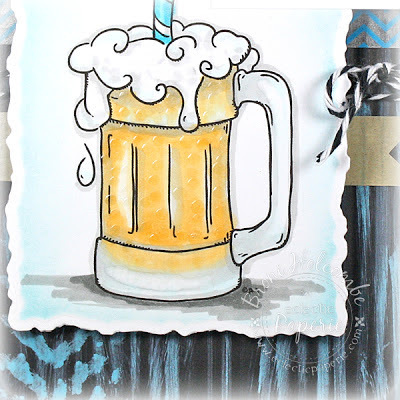 Love the crimped paper and how you created condensation on the mug. awesome card! I love the chevron stencil over the crimped paper. 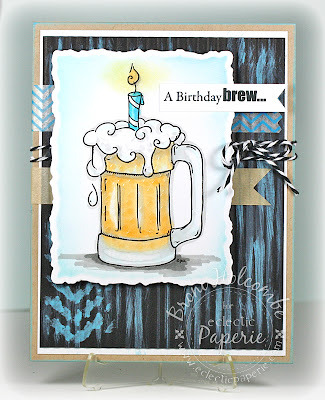 Inking the paper before removing it from the die is a great idea - thanks for sharing! How cool that is Broni, love it!